So as I mentioned yesterday, this week is Flormar week on the blog, and I have made it my mission to inform and enlighten you all on the new Flormar products that are available in Ireland now. 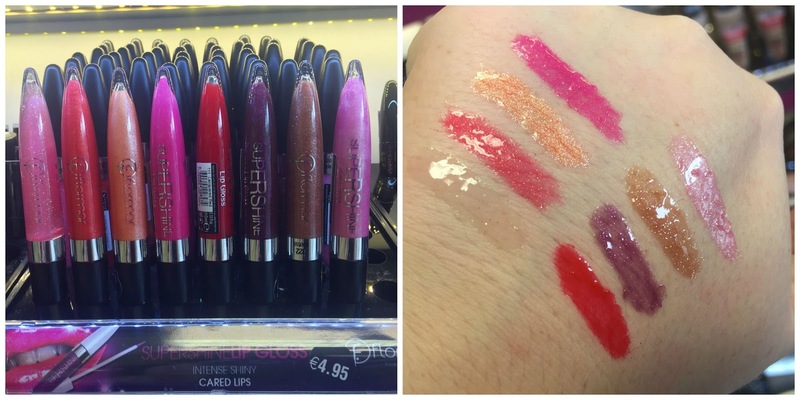 First up are lip products- lipsticks, lip glosses and lipliners. I love my lip products and they were one of the first things I gravitated towards when I first found myself at a Flormar stand. 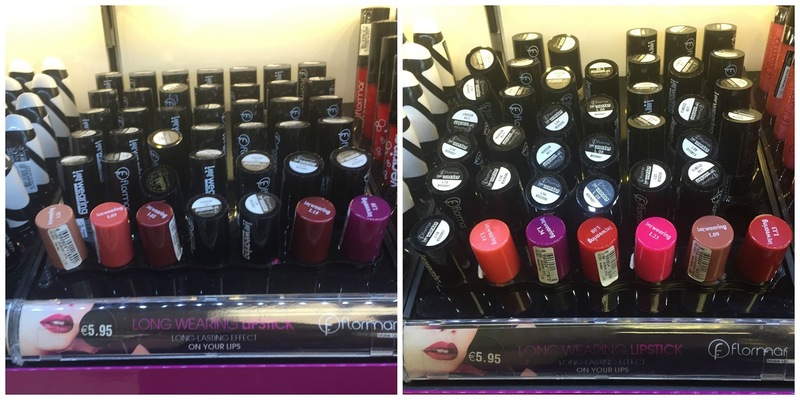 The quick overview is that there are two lipstick types- Revolution Lipstick (€6.95) and Long Wearing Lipstick (€5.95) - two lip glosses - the Long Wearing Lip Gloss (€5.95) and the Supershine Lip Gloss (€4.95)- and Waterproof Lipliners which I belive retail for €2.95 a piece but these are not available in my local stockist which is Medicare Pharmacy Dundrum. I've been a good sport and snapped some pics of the products for your perusal along with some sneaky swatches. 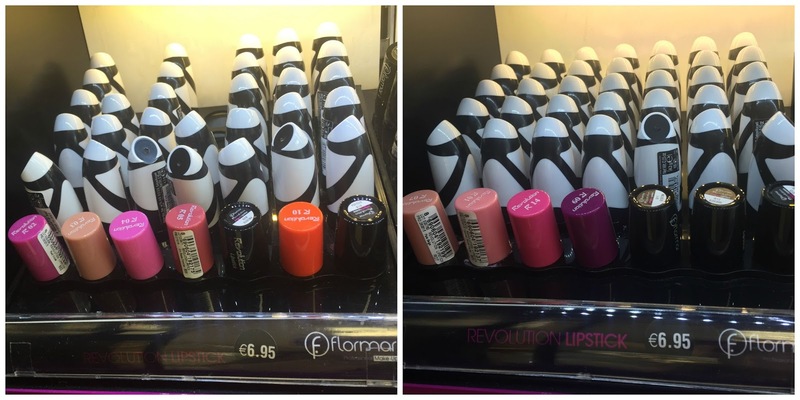 So what exactly are Flormar bringing to market in the lips department? My overall impression from the product lineup is that the colours are all very bright, very vivid and some of the lipglosses are really really glittery. 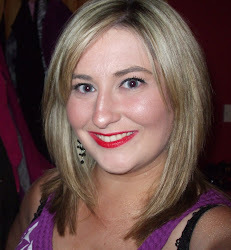 I love lip products but have been favouring the more muted mauvey tones. 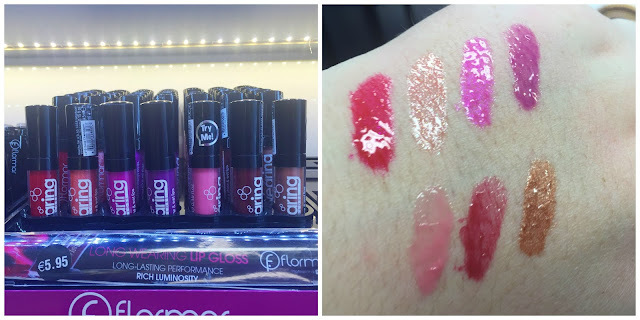 Most all of the Flormar lip products are really bright or really punchy, and I'm not complaining about this at all because there is definitely a gap in the market for good quality, packed with pigmentation bright lipsticks. The purples are a key example of this- it's very difficult to get an excellent quality budget true purple lipstick but Flormar provide one that in the long wearing line that actually rivals MAC Violetta in my opinion for less than a third of the price. All of the products were very creamy and pigmented and literally it just took a swipe to deliver good colour payoff. If muted roses and mauves are your only lip thing, you might not be too enticed by the Flormar offerings. I actually think the lack of more daytime wearable or work appropriate lipsticks might be down to the fact that this brand is manufactured in Turkey and the Turkish women are more daring and better able to pull off these punchy colours. I have a few of the Revolution lipsticks- I was gifted two mad colours altogether that I am going to donate to my 16 year old sister but I do have one pretty tame colour and I've been wearing that for the last few days. It feels nice enough on the lips, isn't too sickenly fragranced that it makes me nauseous and lasted pretty well for about 3 hours before needing to be reapplied. The finish on both the lipsticks appeared to be a satin like finish, definitely not matt and not sheeny or balmy. I'm not much of a lip gloss advocate to be honest, particularly anything with glitter because I feel like I am waaaay too old (I'm in my late 20s and my birthday is next week which is going to plunge me into an even later stage of my 20s- le sigh). I have tried out the Long Wearing Lip Gloss on my lips and it was quite pleasant even though it contained glitter, it was not gritty or thick or uncomfortable on the lips. They didn't smell too strongly and I applied a very thin coat of Backstage from the Long Wearing Lip Gloss line which is a glittery pink-purple and as you can see from the pic below, it wasn't too glittery or vibrant on the lips. The Supershine glosses did feel a bit stickier and were definitely more glittery- if you love a high shine, high impact super glossy lip, you need to swatch the Supershine line! To my great disappointment, I haven't been able to try out the new lipliners yet because, as I mentioned, they are not available in my pharmacy, so I cannot enlighten you as to the colour range of those but I am making it my mission to get my hands on them so definitely watch this space or my social media sites for more deets on those. I swatched a couple the night of the media launch a few months back and I have to say, I think these were the products that I was most excited about trying. It WILL happen. Overall, whilst I do miss the more muted colours as I'm a divil for those work appropriate shades, I think the range of colours is impressive. I wish there were a few more subtle colours that were more complimentary to the typical fair Irish skintones but these might arrive with time as the brand builds presence in Ireland. If I was more adventurous with lip colours, I would probably be stone raving mad about the Flormar lip products. I am making it my mission to find those lipliners so if you find a stockist with the liners in south Dublin, please do let me know. Those lip products that I have tried have been nice and I don't have any complaints at all about anything I've used. Is there anything that is tickling your pickle in this lip line up or have you tried any Flormar lip products and if so, what did you think? I love this bright vivid colours, I own about 3 of the flormar ones and I really like them, haven't tried anything else from the range thought!